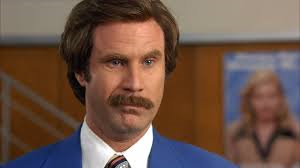 I love the Will Ferrell film ‘Anchorman’. It’s not just the jokes that get me laughing, I recognise everyone of the characters featured (well I’ve worked with all of them at some point in various newsrooms) and I’ve been in similar situations – what rookie journalist hasn’t had to cover a story equivalent of the cat fashion show?! But I’ve always thought the film was an exaggeration, a caricature if you like of a regional newsroom, however lately it has felt like a case of reality imitating art! Several weeks ago, while reading bulletins on Real Radio, I announced that zookeepers in Edinburgh thought that their panda Tian Tian was pregnant, and yesterday their press office confirmed that following a hormone test they are now hopeful that she will give birth in two weeks. Now if you’ve seen ‘Anchorman’ you’ll know that the film ends with Panda Watch where the local news teams are battling it out to get an exclusive on the birth of a baby panda at San Diego Zoo. The characters will stop at nothing to get their story. Hopefully the reporters in Edinburgh won’t be pushing their rivals into bear pits to stop them getting a scoop, but I’m sure they will be out in force, desperate to get the first pictures of the new arrival. So the question on many news editors’ lips over the next few weeks will be ‘has the cub been born yet?’ but there’s only one question on my lips. 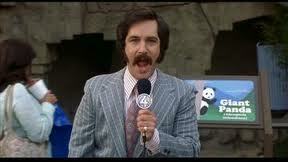 With all this panda-monium I’m wondering whether I’m Ron Burgundy?